With technological innovations right at the corner, it’ll no longer be surprising to see almost everything become automated. Perhaps one of the most helpful and recent technological advances aimed at pets is the automatic dog feeder. As the name implies, an automatic dog feeder allows you to automate the feeding process for your pet. Not to mention, it helps you maintain their diet as well. In this article, we’re going to talk about some of the best automatic dog feeders on the market along with their benefits and a short buying guide. If you work a 9 to 5 job, that only means your dog will be left all by himself for all those hours you’re not there. With an automatic feeder, you can feed him on time, especially during lunch and dinner times. Dogs can easily get bored especially when they’re left at home alone all day. With an automatic feeder, you can give them some sort of stimulation that will help calm their nerves and give them a bit of fun activity to do as well. This is especially true to feeders that allow you to play a voice message to your dog. If you have more than one pet at home, you no longer have to struggle maintaining harmony when feeding them. This is because an automatic feeder will allow you to set the schedule for each of your dogs. For example, you may choose to feed your terrier early in the morning before you go to work, then set it to feed your larger dog an hour or so later. Some dogs, particularly puppies that have a sensitive stomach, can benefit from a consistent feeding schedule. An automatic feeder can help this and even remove the need to monitor the clock regularly just to feed them during the right times. One of the best things about an automatic feeder is that you can prevent your dog from overeating. There are feeders out there which are programmed in a way that they’ll only release tiny amounts of food throughout a certain duration. This can be quite helpful if you want to get your dog to eat small portions at a time. Additionally, it can help reduce, if not prevent, the occurrence of bloating or any other digestive problems. Lastly, automatic feeders allow you to save more time and money from spending on a pet sitter. After all, it’s not that easy to find a dog nanny whom you can trust to take care of your pet. There are plenty of feeders on the market, each of them having their own set of unique features and highlights. Also, they’re really affordable and are designed to last for a long period of time, thereby allowing you to save money in the long run. A gravity-fed feeder is the simplest type of automatic feeder out there. Rather than giving your dog individual meals, it just fills his bowl with dog food until the food reservoir runs out. It is a great choice if you want to feed your dog on a free choice basis. However, it’s not ideal if you have a dog who continues eating until no food is left. A circular dispenser comes with several compartments for storing food. In spite of the name, a circular dispenser isn’t necessarily shaped like a true circle. 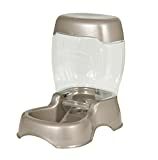 It has a rotating lid which exposes a certain compartment during a certain time, thus giving food for your dog. This type contains a number of moving parts, although they’re less prone to breakage which can potentially lead to choking hazards. There are also some circular dispensers which are programmed in a way that you can provide different meals throughout a certain duration. This type of feeder comes with one or more compartments and feature a hinged lid. During a certain time, the latch is released to open the top of a compartment and allow your dog to gain access to his food. In spite of having a few moving parts, a clamshell feeder has less electrical components than most complicated feeders out there. It also works with any food most of the time. This type of feeder comes with a huge reservoir which only dispenses food once the timer opens up the chute. Generally, this type of feeder is more flexible compared to a gravity-fed system. However, it is more expensive and comes with more moving parts. Also, you need to choose high-quality products and make sure they’re properly maintained. Lastly, vertically-fed feeders will only work with dry dog treats and food, making it unusable for wet foods. Aside from the type of feeder, you should also consider the type of food that a certain feeder allows. Most automatic feeders are designed to accommodate dry dog foods, although other models allow wet food as well. Take time to determine if your dog is into dry or wet food before you even consider a particular feeder. You don’t want your dog’s food to get stuck inside the feeder. Therefore, it’s only ideal to choose a feeder that comes with an anti-jam feature. Basically, this feature prevents food from jamming, thereby preventing your dog from starving simply because his food hasn’t been properly dispensed. 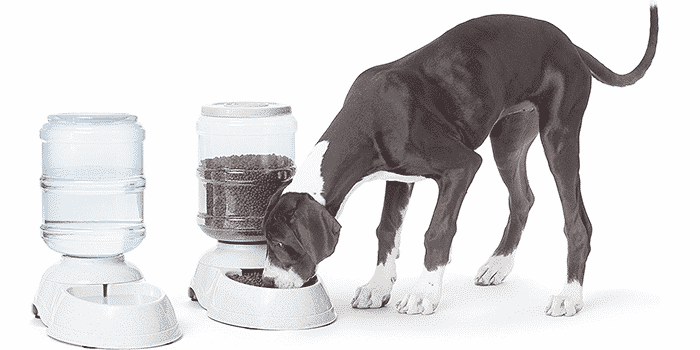 Automatic feeders come in different sizes to hold kibbles of varying size. Depending on how much food you want to store, you’ll have to pick a feeder that’s appropriately sized and comes with the right capacity. Its capacity is determined by how much food it can hold and distribute. Most models on the market are capable of storing up to 10 liters. When picking a feeder, make sure you take a look at its minimum and maximum portion capacity. Also make sure that the amount of food you set to dispense won’t overflow your pet’s bowl. Automatic feeders have a manual mode which allows you to pick a particular time of the day for dispensing food. Most of them have a timer only for a certain time of the day. Meanwhile, high-end feeders will allow you to set a number of schedules within a day. 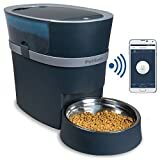 Also, they can provide you with full control of the feeder with the help of your smartphone so you can manually feed your dog using your device. As much as possible, you have to make sure that the food stored in an automatic feeder won’t spoil quickly. Therefore, it is important to look for a model that comes with an airtight reservoir. With an airtight reservoir, you can prevent the food inside from going stale quickly. This is quite important especially for large-capacity units. It’s important to keep a feeder clean most of the time since it can help prevent bacteria from growing, especially when you give your dog wet food. It should be easy to clean, come with dishwasher-safe parts, and easy to disassemble. Albeit a little more expensive compared to the other products on this list, the PetSafe Simply Feed is a combination of control and modern design into one. It’s ideal for those dog owners who don’t prefer a “smart” feeder synced up to their smartphones. With the Simply Feed, you can program the feeder to dispense up to 12 meals a day. You can even choose the amount of food to dispense for each meal. This makes it an excellent choice if you have multiple pets who eat the same food but at different intervals. The portions you can give to your dogs range from 1/8 cup to 4 cups depending on their needs. Also, as it has an anti-jam conveyor system, you can place either dry or semi-moist food inside. If you prefer a “smart” approach for automatically feeding your dogs, then the Smart Feed from PetSafe is a solid choice. 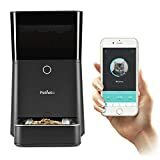 Compared to the previous PetSafe product, this one comes with smartphone capabilities, allowing you to control the feeder using your phone. Aside from that, you can also program it to set time schedules so you can monitor your dog’s eating habits. You can dispense between 1/8 to 4 cups, making it ideal for both small and large dogs. With its WiFi capability, you can operate the feeder wirelessly given that there’s an internet connection nearby. If you’re worried about leaving your dogs behind while you go out for work, then worry no more with this automatic pet feeder from Arf Pets. With this feeder, you can make sure that your pets are fed up to four times every day while you’re away from home. It even comes with a recorded meal call option so they’ll hear your voice while you’re not present. With the Arf Pets feeder, you can provide between one to ten portions measuring 24ml for each meal. Meanwhile, it has a magnetic lid lock to prevent your dogs from getting access to the food inside along with an LCD screen so you can know if you’ve properly set the settings. If you’re looking for a feeder with additional functions, then the SmartFeeder from Petnet is just what you’re looking for. As a “smart” feeder, it comes with a WiFi capability which allows you to control it via your smartphone. The feeder can store around 5 to 7 pounds of dog or puppy food. Additionally, it has a rechargeable battery which can serve as a backup. One of the best things about the Petnet feeder is that it can also provide you with meal recommendations just in case you don’t know which food to give your pet. All you need to do is simply enter his age, breed, weight, and activity level on its application. Sporting a simple circular design, this no-frills feeder contains six pans, which allow you to schedule up to six meals for your dogs. It has a rotating lid which will reveal a meal during a certain time. Although the portion size can be quite limited, the good thing is that it allows you to feed wet food for small dogs. Just like the other expensive feeders out there, this one comes with a voice message record function at a very affordable price. The problem, however, is that it’s not that sturdy and durable, making it easy for heavy chewers to raid the food inside. The WestLink feeder is a budget-friendly option that comes with a voice recorder and speaker. With this, you can record up to 10 seconds of voice message so your pets will feel as if you’re there even when you’re away from home. It can schedule up to 4 meals every day, with each meal dispensing around one to 39 portions weighing 10 to 12 grams each. However, the size of the food shouldn’t go beyond .39 inches, making it not ideal for dogs who prefer eating large kibbles. Overall, it can hold up to six liters of food. It even comes with an infrared sensor to prevent it from dispensing food when there’s still some food left in the bowl. 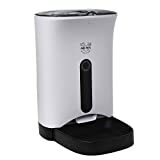 Yet another quality product from PetSafe, this pet feeder (as the name implies) allows you to schedule 5 separate meals at different intervals throughout the day. As it’s fully programmable, you can easily decide when it will open and provide your dogs with food. Additionally, it’s very easy to use and set up. It even comes with a clear LCD screen so you can set meals with ease. Lastly, its BPA-free plastic construction is durable and reliable, giving you peace of mind knowing that it won’t get broken so easily. With its simple design, the Petmate feeder is perfect if you want an automatic feeder that doesn’t come with a lot of confusing features. 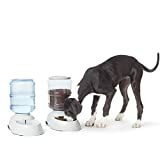 It’s basically a gravity-fed feeder that will make sure your dog’s bowl is consistently filled with food at all times until the storage is empty. It has a clear container so you can know the level of food remaining as well as an extra wide mouth to allow food to go through without the risk of blockage. Lastly, it has a removable lid so you can refill and clean it with ease. If you’re looking for a budget-friendly feeder without compromising its quality, then this gravity-fed feeder and waterer from AmazonBasics is definitely worth looking into. Basically, it’s a package of a feeder and waterer in one (you can also choose to purchase just one at half the price). With its size, it can hold up to 12 pounds of dry food. It’s even made of transparent PET plastic so you can know the remaining level of food inside. As it has a simple design, you can easily clean it whenever the need arises. It has non-skid feet to prevent it from sliding across your floor, and there are no moving parts which can lead to possible choking hazards. 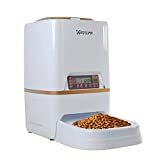 When choosing an automatic dog feeder, you also have to consider the age, weight, breed, size, and activity level of your dog. 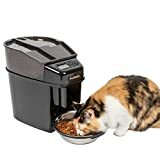 By doing so, it will be a lot easier to come across the best automatic dog feeder that can easily meet your little friend’s eating needs and habits. By making the right choice, you can hopefully provide your dog with the right amount of food and control his diet even when you’re away from home. We are a team of dog owners who are passionate about our four-legged friends. Our goal is to provide other dog owners with enough knowledge to ensure that their dogs are healthy and happy. GoodDogsCo is devoted to reviewing all sorts of products your dog may love. We strive to provide unbiased reviews to help you choose only the best for your four-legged friend. Besides, you’ll find a lot of advice on how to keep your dog happy and healthy.